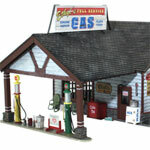 This vintage gas and service station with its open-beamed overhang, the old globed gas pumps, decals, signage and scene-setting detail is loaded with charm and nostalgia. Details include trash cans, an old bench and chair, cola machine, ice machine and pallets of old junk and car parts. The fenced outdoor service area features an oil-stained concrete floor, a lift, free-standing kerosene tank, old tires, dolly, pole lights and loads more. Includes one amber-colored exterior and two white interior lights. Colors may vary from actual product. A collection of realistic dead-fall tree pieces. Great for fallen tree debris along streams, riverbeds and forest areas. Set of 14 white metal cut stump castings. Unpainted. Assorted sizes. Set of 14 white metal castings broken stumps. Unpainted. Assorted sizes. Great for modeling grass, ground cover and highlighting and accenting landscape foliage. Soil brown tone fine turf in 8 oz. bag. Also available in 32 oz. shaker bottle WD1341. Use also to blend rich, soil textures of our NEW O-Scale vegetable garden sets (FC1697- FC1703) and O-Scale Corn Stalks (FC3974)! 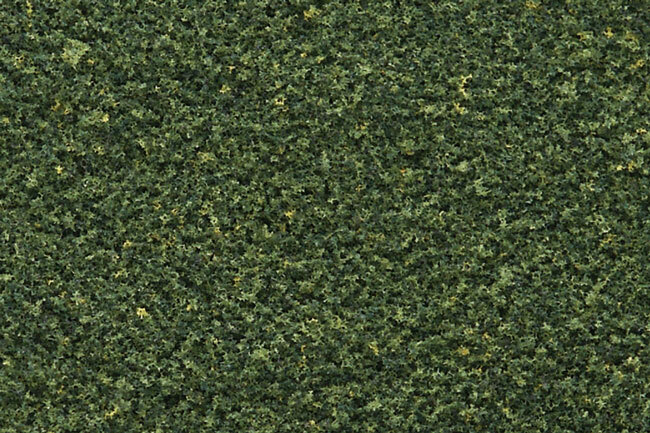 Great for modeling grass, ground cover and highlighting and accenting landscape foliage. Earth tone fine turf in 8 oz. bag. Also available in 32 oz. shaker bottle WD1342. Great for modeling grass, ground cover and highlighting and accenting landscape foliage. Yellow tone fine turf in 8 oz. bag. Also available in 32 oz. shaker bottle WD1343. Great for modeling grass, ground cover and highlighting and accenting landscape foliage. Burnt Grass tone fine turf in 8 oz. bag. Also available in 32 oz. shaker bottle WD1344. Great for modeling grass, ground cover and highlighting and accenting landscape foliage. Green Grass tone fine turf in 8 oz. bag. Also available in 32 oz. shaker bottle WD1345. Great for modeling grass, ground cover and highlighting and accenting landscape foliage. Dark weed tone fine turf in 8 oz. bag. Also available in 32 oz. shaker bottle WD1346. Ho-scale apples and oranges for modeling orchards. Add color to layout. Easy to apply. Simply mist tree with matte medium and sprinkle on fruit. One package each. 1-1/2 cu. in. Flowers - Four assorted colors (yellow, orange, white and red) of fine ground foam for modeling flowerbeds and flowering trees. 1½ cu. in. Blended turf works well as a base coat to model grass. Available in 2 sizes: 30 oz. bag or 32 oz. shaker bottle. Foliage fiber is great for leafy plants, trees, vines or other low growth. 60 sq. in. of foliage. Excellent for indicating trees, vines, weeds, bushes or any low growth. 60 Square Inches of Foliage. Foliage fiber is great for leafy plants, trees, vines or other low growth. 60 sq. in. of foliage. FOR WEB ORDERS ONLY!